TuMM officially launched in June 2011, with a performance of Ari Christopher’s “Suchness” on the bank of the Arkansas River. The seeds for TuMM were planted the previous year, however, when Ari saw Nina Madsen (newly arrived from Brooklyn) perform a solo in the Contemporary Dance New Genre Festival at Liggett Studio downtown in February 2010. I was in the audience that evening, too, and Nina looked like nothing I’d ever seen in Tulsa before. Her choreography in that solo, called “Shades,” was repetitive and hypnotic, deeply expressive without any of the conventional dance tropes meant to create “drama.” She could move with lightning speed, then expand into stillness without ever losing energy. (Excerpts can be seen in TuMM’s montage below.) It was obvious she’d seen the wider world, as indeed she had, as a graduate of the respected dance department at the University of North Carolina-Greensboro, with its focus on release technique, and of the Laban Institute, and as a dancer with Amanda Selwyn and others in New York. The process of creating “Between Us” was intensely experimental; for every passage that stayed, there were three or four drafts (or more) that were discarded. We rehearsed only three hours a week — it was all any of us could spare or afford. The eight women in the piece had never all worked together before, though several of us had grown up dancing together or had worked together in other companies. And Nina’s choreography was something new for many of us, equal parts pedestrian and rigorously complex (some of us — erm, me — were still counting under our breath on opening night of New Genre). There were no fancy moves, no pirouettes or balances. Sometimes it seemed like there were barely steps at all. In her work, simplicity, clarity, and authentic movement quality were everything. Nina’s enthusiasm, intelligence, and willingness to persevere in her vision kept us going in what sometimes seemed like very foreign territory. Nina knew there was more to discover in “Between Us,” and decided to turn it into an evening-length piece. There were a lot of discussions among the directors early on about the arc of the work; it has developed into a very diverse and emotionally rich hour, touching lightly on a narrative about how what we think we’re hiding tends to ripple out into the lives of those around us, and about how we develop a more genuine, secure identity both in ourselves and within a group. “I believe that meaning is revealed through movement,” Nina has said. “In this piece I wanted to explore how what’s not said, what’s not acknowledged, is just as charged with life as what’s out in the open.” The movement in “Confessions” is sometimes sharp and bound, sometimes broad and flowing, influenced by her work in Laban Movement Analysis and by the honesty and articulateness of groups like Batsheva Dance Company. The music she chose for the work’s 12 sections — with titles like “Falling,” “Fighting,” “Split,” “Play,” and “Tribe On” — ranges from simple bells to dramatic string quartets, from the meditative to the exhilarating, as 11 dancers go through the phases of waking up to the stories of their own lives. There are several solos in the piece that show that journey vividly, or show parts of it that will later be completed by other dancers. My solo begins and ends in a state of being literally overwhelmed by those around me — they surround me and pull me down. In this section Nina explores some fundamental questions: “How do I get some space to move in? How do I move when I do finally have some space? Can I allow others to be present without feeling threatened? Can I stay present myself, or will I feel the need to escape or hide?” These are questions about life, which Nina very swiftly translated into movement. Some of the movement she took from natural gestures — a hand that strikes out in refusal; fingertips reaching to the edges of the kinesphere in exploration; a body that collapses and then rights itself, only to collapse again. 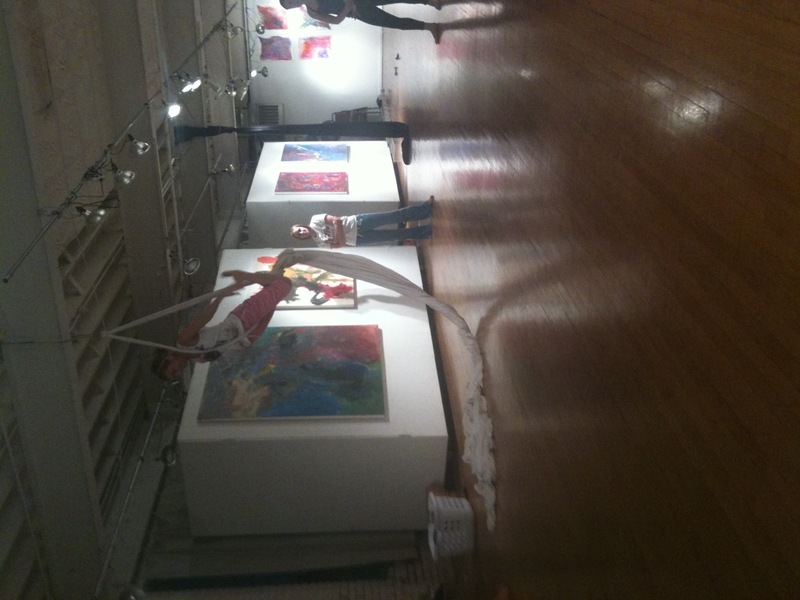 Other movements are more abstract, but still linked to the energetic thread she’s exploring in that moment. “Meaning is revealed through movement,” she says. Nina really means it. The story is already there in every effort, every pull in space, and it’s up to the dancer to discover it in her own body. Speaking of dancers, the cast of “Confessions” includes some of the very best in town — women like Rachel Bruce Johnson of The Bell House, Jessica Vokoun of the University of Tulsa and the Oklahoma Dance Film Festival, and Megan McKown-Miller of Soluna Performing Arts Group (formerly of Tulsa Ballet). Jen Alden, Jamie Beller, and Cassie Hampton, all with Portico Dans Theatre, have been working with TuMM since 2010. You’ll also see Margaret Leighty and Mona Hatter, both classically trained dancers who have found new life in modern dance (as have I). And of course, Nina and Ari, whose discovery of each other at Liggett Studio was the beginning of a passionate partnership that has turned into a powerful new company on the local scene. “Confessions” premieres June 9 and 10 at Tulsa Ballet’s intimate Studio K on Brookside, where a commitment to fostering creativity means that Tulsa audiences have a chance to experience exciting new dance not just from around the world, but now also from Tulsa itself. Tickets are $15 at the TuMM website. You know Oklahomans produce amazing music, art, photography, and theater. I think you’ll be amazed to discover that dancemaking on such a high level is happening here too. And not just from TuMM. Coming up on the blog: a look into Portico Dans Theatre’s “BorN” (premiering in July) and the 2012 edition of the EXCHANGE Dance Choreography Festival (in August) — two other events in which local artists are adventuring into new movement and new ideas. Stay tuned. But verily: the times, they are a-changin’. Having taken or observed a few of these Portico classes, I can say for certain that they are a) a very fun workout and b) a chance to push oneself, physically and mentally, past one’s point of comfort. They move fast, so if you’re new to dance or just coming back to it after some time away, be prepared to catch up quickly. Even if you’re lost for a minute, you’ll have a blast — it’s good energy in these rooms, with teachers who love what they do. You’ll also find a studio full of happy grown-ups, whom Portico gives the opportunity to train and perform all over the city. Never heard of release technique? It’s a relatively new one, and Nina emphasizes that unlike Graham or other techniques, it’s “not a codified system.” “There’s no one founder, and practitioners may make use of a variety of tools within the general framework of ‘release.’ In that sense, it’s very postmodern,” she says, though in most instances the links to practices like Laban Movement Analysis (another very helpful link here) and body-mind centering (pioneered by Bonnie Bainbridge Cohen) will be evident. I’ve gotten to spend a lot of time in the studio lately, working with some of the most interesting and passionate folks in Tulsa — and a very special visitor, as well. To say creating a new “R&J” is a tall order is to understate the matter. The greats of choreography have made their mark on the ballet over the decades, beginning with John Cranko in 1962 and continuing with Kenneth MacMillan, Rudolf Nureyev, and most recently Alexei Ratmansky, whose production last year at the National Ballet of Canada drew lavish praise. Liang was hard at work when I visited the Tulsa Ballet studios. It is, as Angelini said, “crunch time,” with the premiere about a month away. I look forward to sharing more with you about his creative process and his approach to “Romeo” as we near opening night. And there’s a new festival emerging — it’s called eMerge, as a matter of fact. More on that in a bit. It’s going to be a busy season, folks, with more original dance work being created and performed than ever before in this city. Spread the word.